A cinch to make and tastes oh-so-gourmet! In a bowl toss the tomatoes with lemon juice, cilantro and extra-virgin olive oil. Season with salt and pepper; toss again and set aside. Wash chicken and remove any excess fat. In a clear plastic bag pound the chicken thighs until flattened out a bit. Season with salt and pepper. In a large bowl beat the eggs with the mustard and cayenne pepper. Season with a dash of salt and pepper. 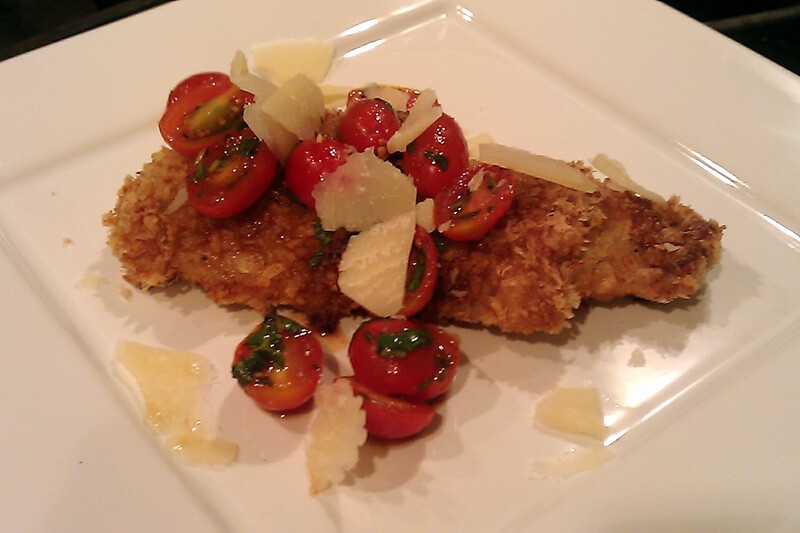 In another bowl put the panko. Dip the chicken in the egg mixture, then dredge in the panko. In a large skillet, heat 1/3 cup oil to medium-high. Fry the chicken until browned 5 to 6 minutes per side. Transfer the chicken to plates and spoon the tomatoes over the chicken. Garnish with the cheese and serve. Oh that does look good. I love the shaved cheese on top too.